“Yep,” Hakone said, and filled his mouth with noodles. Ayane waited. Hakone chewed, swallowed, and swirled another bundle of noodles onto his chopsticks. Ayane could sympathize. She bit down frustration and ate her onsen egg first, as always. As always, Hakone scooped his own egg out of his bowl and added it to hers. “Did you see the report before Shirotani whisked it upstairs?” Hiaishi Riei asked. “2000 ryou says it was monsters,” Norita Takeshi said. “No one I’d wish you on.” Usagi smiled sweetly. “Hatake is going to burn your entire face off,” Usagi observed through strangled laughter. “Who’s Tousaki-san?” Ino whispered to Shikamaru. Ino didn’t usually hang around to listen to Naruto’s stories, but this one was really good. Ume slumped forward on the kitchen table, crumpling the homework she’d been marking. “In one piece?” she asked her folded arms. “I haven’t heard otherwise,” Shun said, with her usual measured precision that was as reassuring as it was annoying. “I think she was mistaken,” Shun said. “You’ll embarrass him,” Shun said. She stomped out of the door. Fondly, Shun followed her. “Perhaps if you told me what sort of blessing it was you were seeking…” The young priest traced a worried circle on the smooth wood of the counter. “Just… one minute, Shiranui-san.” He disappeared into the interior of the temple, black robes flapping around him. Yuuichi took the moment to admire the architecture. The beautifully carved gables supporting the enormous tiled roof. The bronze turtle brazier, where softly smoking joss sticks perfumed the courtyard air. The five-storey pagoda soaring into the blue sky. For the first time in three weeks, he could breathe without a knot under his sternum. The old priest put a hand on Yuuichi’s arm. “I’m very happy for you. We will have tea to celebrate.” He tapped the younger priest on the top of his shaved head. “Tea for our guest. And pickles.” The young priest bowed and scurried away. “All of them?” Intern Ando’s voice rose sharply in alarm. “Enough,” Danzou said. He lifted his hand from his temple and waved the agent away. This was the fifth report he had received regarding ANBU Six’s whereabouts, each more fantastical than the last, each from a different source within Konoha. With so much chatter in the air, it was impossible to separate truth from wild rumor. Danzou was beginning to regret not pressing Shibata when he’d had the chance. No matter. There were far more important things that required his attention — the loose ends from the Hikouto coup, the potential benefit to be derived from Mist’s destabilization, and now, Shibata’s confirmation of Orochimaru’s presence in Lightning Country. He returned to his desk and sat stiffly down. The rain had yet to let up, and the damp had sunk into his joints, making them ache. He was just about to summon his assistant for more tea when chakra flickered at his open window. 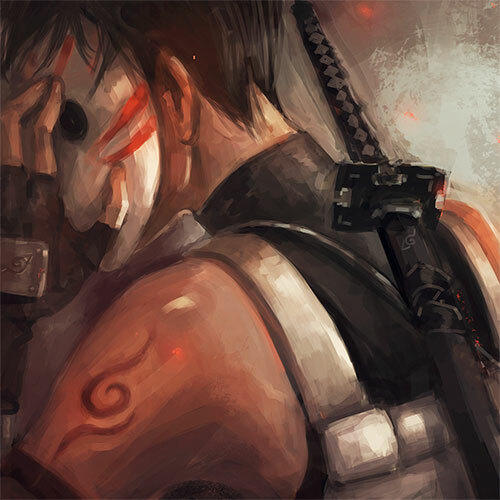 “I quit,” said Morita Rei, ANBU’s beleaguered Quartermaster. Morita shoved his entire hand through one of the holes bitten into the chest plate and wiggled his fingers in despair. “Admittedly, it’s not great,” she added. “Is that really any more difficult than a giant scorpion-dog queen?” Aiko asked. A long curving tooth sat on a shelf, part of an array of terrible pointy things the Quartermaster’s office had collected over the years. He gave it a look of extreme distaste. Its fine point had torn through his last four attempts at a tighter woven mesh for the undershirt, but he had high hopes for the fifth, now that they’d solved the conductivity problem of integrating metal through the cloth. “What else is new?” Raidou muttered, squinting at his seventh report. Oh m’y ! Yuuichi who’s going to pregnancy charms ! 😄 And Raidou’s mums ! I just so much laught ! Thank you ! Ooh, Rin! I thought she’d been retired from the cast, I’m so happy to see her back! Those pregnancy rumors almost killed me with laughter. Technically, Genma has once almost gotten pregnant… he just most definitely wouldn’t have survived the birthing process. Oh, Yuuichi-san, that charm would, maybe, have helped earlier. 😀 So many updates in a month, my rereading binge is being indulged with more content and it is glorious. 😀 Thanks so much! I’m cracking up. This is brilliant.